This insurance company has its ducks in a row. Most investors and U.S. consumers know that AFLAC Incorporated (NYSE:AFL) sells supplemental insurance policies that mostly cover people if they get sick or injured, causing them to miss work. They also probably know that Aflac peddles their policies primarily through ad campaigns that feature its charming Aflac Duck mascot. But here are six things most investors probably do not know about the insurance company. 1. What's in a name? On November 17, 1955, three brothers, John, Paul, and Bill Amos, opened the American Family Life Insurance Company of Columbus. In 1958, the company began selling cancer policies after seeing cancer patients' great need for financial assistance. In 1964, the company changed its name to American Family Life Assurance Company of Columbus, setting the stage for the company's name as we know it today. That same year the company shifted its concentration to businesses, primarily through employer-sponsored policies and paid via deductions from payroll. In 1989, the American Family Life Assurance Company of Columbus officially adopted the Aflac acronym as its name. Injured or sick and can't work? Aflac provides insurance for that. Image source: Getty Images. The best insurers, like Aflac, make a profit on their insurance policies. They collect more in premium revenue than they pay in administration and benefit payouts. Premium money that has yet to be paid out for claims is invested. This is called float. When companies acquire funds to invest for free or, better yet, get paid to acquire those funds, they are effectively being given a negative interest rate loan that they can use to invest. Aflac conservatively invests the float in fixed-income vehicles. At the company's 2017 Outlook Conference Call last December, CFO Fred Crawford stated that, this year, the company expects to invest about 70% of new money into yen fixed-income assets and 30% into dollar fixed-income assets. Given the nature of Aflac's investments, one could expect it to profit handsomely if and when interest rates in the U.S. and Japan increase. 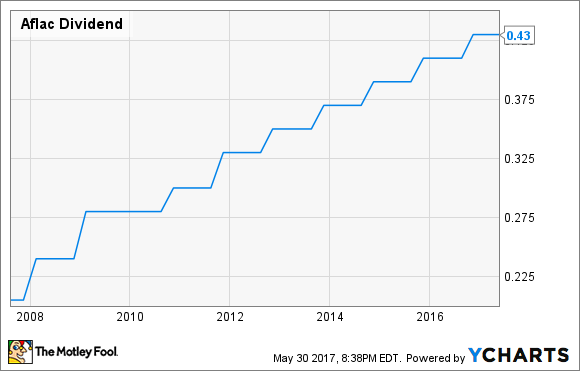 Aflac has been paying a growing dividend to shareholders for 34 straight years, making it a member of the elite Dividend Aristocrat club. A Dividend Aristocrat is a company belonging to the S&P 500 that has increased its dividend at least once per year for 25 consecutive years-an extremely difficult feat! Not only does Aflac have a long history of increasing its dividend, Aflac's shares currently yield 2.3%, better than the S&P 500's average of 1.9%. Aflac's dividend also looks like it is extremely safe from being cut. Aflac's trailing twelve-month EPS is $6.15. Its annual dividend is $1.72. This gives Aflac a payout ratio of just 28%. This means Aflac has plenty of room for dividend increases and should keep that 34-year streak going for quite some time! In 1974, Aflac obtained a license to begin selling insurance policies in Japan, one of the first U.S. companies to do so. In 1984, Aflac Japan introduced the world's first dementia care policy. In its 10-K, Aflac stated its business in Japan "sells voluntary supplemental insurance products, including cancer plans, general medical indemnity plans, medical/sickness riders, care plans, living benefit life plans, ordinary life insurance plans and annuities." Today, Aflac Japan generates over 60% of the company's total revenue. For Aflac, all applicable figures can be found on its latest 10-Q filing with the SEC. For the numerator, add Aflac's "Benefit and claims, net" with "Total acquisition and operating expenses". The denominator can be found by adding Aflac Japan's and Aflac U.S.'s net earned premiums from page 14 of the 10-Q. A combined ratio under 1.0 is what investors should look for, as this signifies the insurance company is making profits on its underwriting policies before its investment income is considered. While I cannot say I have calculated this ratio for Aflac in every single quarter, I have done it often enough over the past couple of years and have never found it to be over 1. On January 1, 2000 Americans were introduced to the Aflac Duck in its first commercial, Park Bench, during a college football bowl game. The Aflac Duck has since appeared in over 70 U.S. commercials. In Japan, the Aflac duck was introduced in 2003 and has helped catapult the public image of the company to the extent that, today, more than 9 in 10 Japanese recognize Aflac's brand. There are several different ways to view an investment in Aflac. On one hand, I couldn't blame an investor for saying that any investment that depends on interest rate levels and exchange rates for the yen, is too difficult to accurately follow and forecast. On the other hand, an investor looking for a safe and reliable stream of income could do far worse than a company with a 34-year track record of increasing dividends and a payout ratio of only 28%.